PERU 1698 2 ESCUDOS NGC 64 1715 FLEET 300th Anniversary PIRATE GOLD TREASURE COIN TRICENTENNIAL 300th ANNIVERSARY DISCOVERY!!! CUZCO PERU 1698 2E NGC 64 FINEST KNOWN! 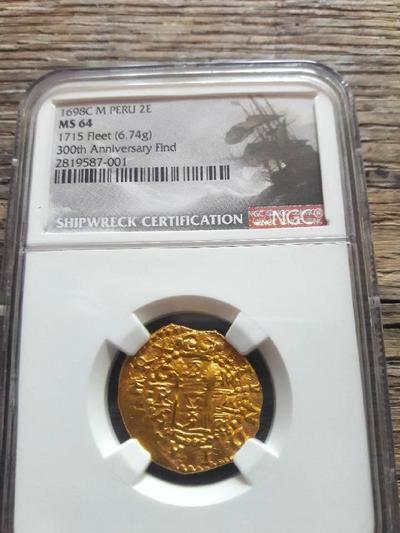 1715 FLEET CII GOLD TREASURE COB DOUBLOON COIN From the 1715 FLEET Shipwreck we are very honored to be able to offer this CUZCO 1698 “LIMA CUT” 2 Escudos in NGC 64 (Finest Known of 3 Lima Cuts). We’ve had several of the 9 total pieces known (both Lima & Bogota cuts) in the Census, but this is a FINEST KNOWN “LIMA CUT” (we’ve had a 63 Lima Cut that we sold last year). There are two types of cut varieties. 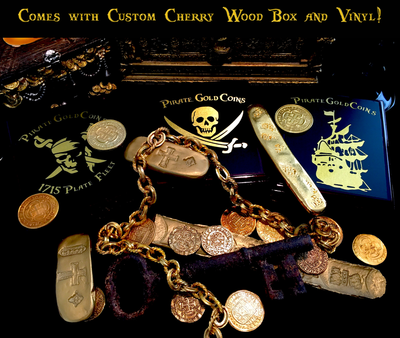 The typical cut, known as the “Bogota Cut,” is the squarish, squatty, smaller diameter planchet, very crude look. Whereas the “LIMA CUT” of which I’m only aware of (3) three pieces out of the 9 total 1698 Cuzco population report (grades: 62, 63, and one in 64 this Finest Known. The known 62 is a very nice piece, has a full date, a couple of flat spots as well, including one flat spot over the crown, making it non visible; but still a very nice piece. The 62 was graded within the last two years and was offered to me at over $22k! 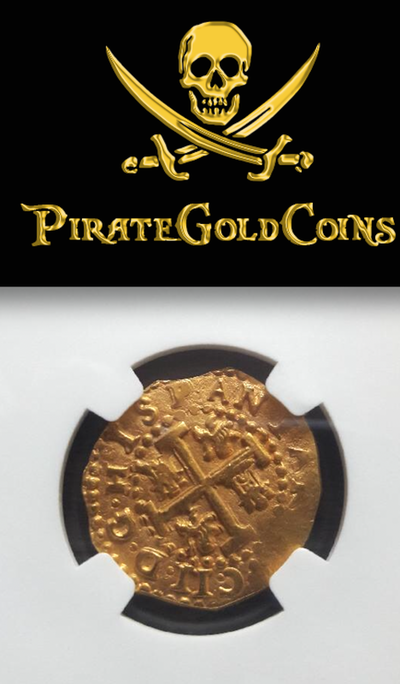 This piece is Royal like planchet (large 21-22mm), which there are several known for Lima that are Royal Like (one is on a 1697 8E and the other a 1712 8E). The Obverse displays a FULL CROWN and FULL DATE (completely unobscured)! To many purists in this filed, this is what’s most important, to have a FULL dated unimpeded by any distractions whatsoever (I would have to agree with this desired quality as ranking number 1 in importance). The mint mark “C” and Assayer “M” are completely visible. The Obverse legend is almost complete (RARELY seen), depicting: ETYND ISPANUM REX (King of Spain and the Indies). Newly conducted research by Jorge Proctor that the Assayer could have been Ambrosio Leyba Marcocho (as opposed to previously thought Cristobal Melgarejo of Lima in 1709). Marocho was appointed to the Foundry on November 23rd, 1686. The Cuzco mint was shut down in 1699 (and is also the year these 1E and 2E dated 1698’s were probably actually struck). It was shut down due to a lack of money, the mint building was actually finished in August of 1699. They built retail stores around it originally in order to increase the security of the mint (since the stores also had their own security). The Cuzco mint, fairly recently was turned into a hotel in the 1950’s. The Reverse is EXEMPLARY! The Legends: C.II DG HISPANIRVM (Charles II by the Grace of God SPAIN). The CROSS is FULL and undoubled. The LIONS & CASTLES are Boldly and deeply struck (so much so that you literally can see the details in the Lions mane, one castle has very slight doubling). Certainly at the top of Importance is the King’s Ordinal (CII) Charles II, of the pieces I’ve seen, which is basically 100% this example is by far the BEST strike of the King’s Ordinal known to this researcher. The weight is at 6.74gm, a FULL Weight! . This piece again, is far superior in aesthetics and which resembles a Royal!